Simple Salmon. This is an exceptionally simply, stress-free salmon dish guaranteed to get your taste buds going.. This is an exceptionally simple, stress-free salmon dish guaranteed to get your taste buds going.Salmon is an excellent source of vitamins, minerals, high-quality protein and Omega-3 fatty acids. Omega-3 is an unsaturated fat that helps promote good heart health by lowering triglyceride levels, which can build up cholesterol if too high. 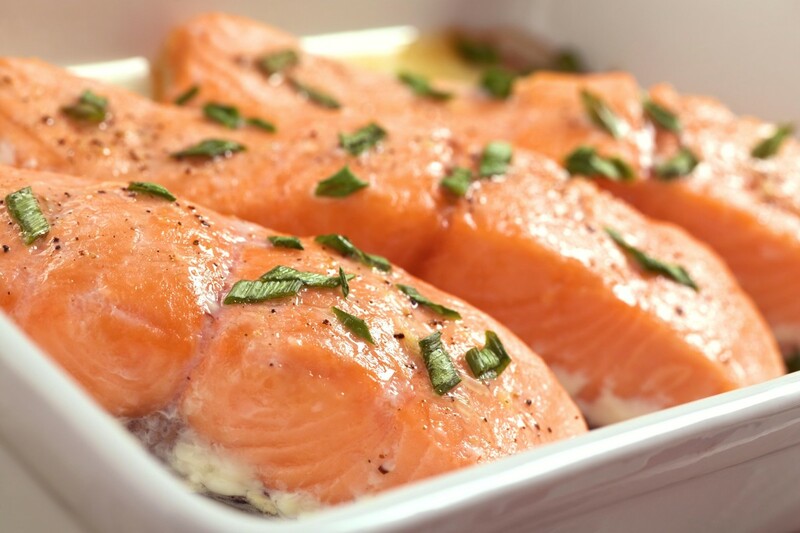 Atlantic salmon has been shown to contain the highest concentration of Omega-3, and we would always recommend you buy fresh salmon over frozen, canned, or smoked cuts, where the salt content can be rather high. Our doctors recommend that you consume at least two portions of fish per week, promoting oily varieties such as salmon, mackerel, sardines, herring and fresh tuna where possible. We’ve coupled the fish with some flavoursome, vitamin-rich vegetables and roasted potatoes. Any green vegetables go perfectly with salmon, but if you’re looking to boost your health quota even further, experiment with dark leafy greens such as broccoli, spinach and kale, which have an impressive vitamin and mineral content. For an extra flavour kick, try seasoning new potatoes with crushed garlic. Heat the oven to 220°C/gas 7. Place the halved potatoes in an oven-proof dish and drizzle with 1 tbsp of olive oil. Season lightly with pepper and oregano, and leave them to roast. Place the salmon fillets and vegetables in a separate dish and drizzle with 1 tbsp of olive oil. Season lightly with black pepper and place the dish in the oven once the potatoes have been roasting for 20 minutes. You may wish to seal your vegetables and salmon with baking foil to keep them moist. Leave the salmon, vegetables and potatoes to roast for a further 20 minutes. Serve with a handful of fresh basil and a slice of lemon.